Today’s recipe is for all the parents whose toddlers get pleasure from winding their mummies and daddies up as much as possible during each meal. Look! They think. Daddy’s face goes so red when I refuse to eat that! Look! Mummy’s head is about to explode each time I shriek! How about I drop the rest of my dinner ON THE FLOOR – won’t THAT reaction be hilarious. Ah yes. Lovely mealtimes like that with Miss F are the reason why Vegie Smugglers exists. We had SO MANY unhappy dinners together. So much scraping of uneaten food into the bin. So often I was SO CLOSE TO LOSING IT. We were locked in an ongoing food battle. I was determined to win the war, because I love to eat and I hated that dinnertime had become so miserable. And last Friday night when I watched a now 8-year-old Miss F crunch happily through a salad of corn/snow peas/broccolini & cos, I realised that I HAD WON. But how did I start to turn things around? Well Miss F liked cheese, so I started there. I made her cheesy pots. And she liked bread, so I gave her salmon pikelets (at first without the green bits). I started with what she DID eat and expanded out from there. So if your little food fascist likes tinned spaghetti, then this recipe might be your starting point. Do whatever you need to do to have some dinnertime wins and if that means sneakily replacing a junk favourite with a healthy home-made version then DO IT. If they eat this happily then next time you could make it with wholemeal pasta. Or put in some grated carrot. Then, in a while, try little chunks of carrot instead. If they like these flavours, migrate them to a lasagna, cannelloni or a lentil pasta sauce that has more smuggling potential. As time goes by, you’ll have to do less and less to hide anything, until they happily just eat a raw carrot or snack on grape tomatoes. Watching Miss F munch through her raw greens, I was so glad that I’ve put all the effort in. Most toddlers are fussy eaters and without intervention many will grow to be fussy tweens/teens & adults. Teaching them how to love healthy food is a gift they will carry for life. I don’t usually stipulate organic products, but think in this simple recipe they’re essential. Bring a large pot of water to the boil. Add the pumpkin and cook until soft (about 7-10 minutes, depending on the size of the pieces). Use a slotted spoon to remove the pumpkin and pop it into a drainer (keep the water boiling). Pop the spaghetti into the same boiling water and cook according to packet directions. Put the beans, cooked pumpkin, passata and sugar into a medium-sized saucepan. Bring to the simmer and cook for 10 minutes. Use a stick blender to blitz everything up into a smooth sauce. Drain the spaghetti then add into your tomato sauce. 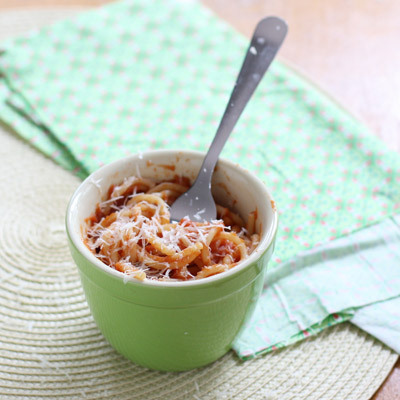 Serve topped with Parmesan. For a more substantial meal, top with crumbled crispy bacon or pop in some meatballs (try this lamb meatball recipe). 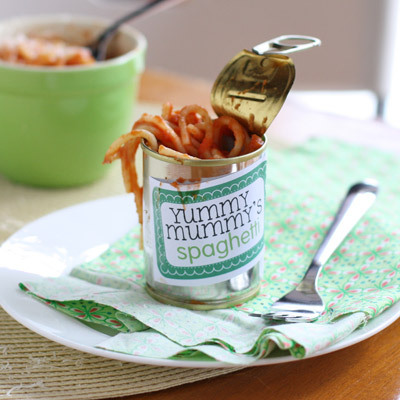 MAKES ABOUT 8 TODDLER PORTIONS (freeze some for easy dinners in a flash). This recipe appears in my new “Kitchen Collection” cookbook, with toddler-feeding tips and 125 family-friendly recipes. How to get fussy kids to try new foods. My top 10 tips to smuggle vegies into children. I love you. I will be making this after a trip to the supermarket. Thanks for this. My kids aren’t really all that fussy (although they do have their moments) but I’ve been trying to find a recipe to replace their much loved canned baked beans. They adore baked beans but I would prefer if I could make them myself and freeze in portions butso far I have had trouble trying to copy that red sauce. Most of the recipes I found online tasted totally different. Do you think the sauce from your recipe might come close? This sauce is thicker and less sweet. Because, well, it’s healthier! Maybe give them a break from their favourite for a couple of weeks then make this one. Hopefully they’ll be so enthusiastic that the difference won’t be a problem. Thanks, I’ll give it a try. They haven’t had them in months, so i might be successful. I suppose I can always thin it out a bit if it ends up too thick and add some stevia for a while then reduce it to wean them off the sweetness. yep, that would all work. This is a winner in our house! I sat and smiled very smugly watching my 2.5 yr old wolfing down her scetties! Thx and lovin the blog. Yay! Thanks for letting me know Eva – I’m really happy to hear that it’s going down well. Made this for the first time today and both my boys wolfed it down! Definately a winner in this house!